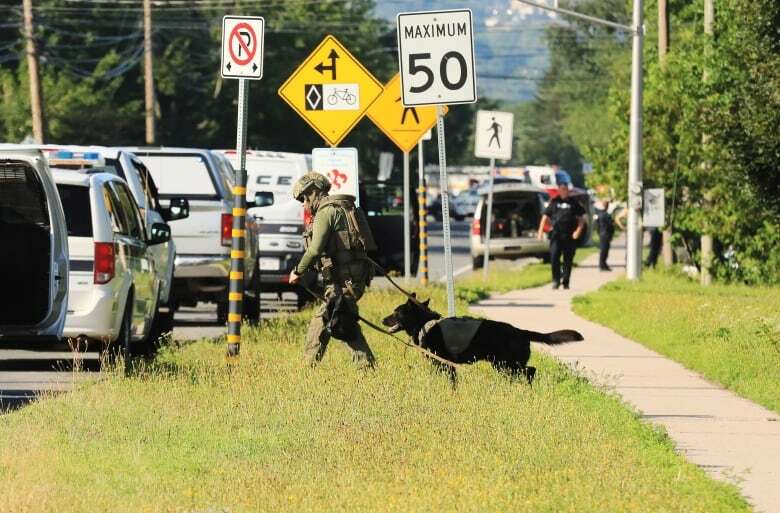 A shooting in a residential area of Fredericton on Friday morning left four people dead, including two police officers. Here's a timeline of what happened at an apartment complex in the New Brunswick capital's north end. Victims of Friday's shooting from left to right: Const. Lawrence Robert Costello, 45, Const. Sara Mae Helen Burns, 43, Donald Adam Robichaud, 42, and Bobbie Lee Wright, 32. Around 7 a.m.: People report hearing gunshots in the area. One area resident says he woke up at 7:07 a.m. to the sound of shots outside his bedroom window. "At first I thought it might be kids playing with firecrackers or a car backfiring," said David MacCoubrey. He said the shooting stopped for about five minutes, then started up again, stopped for around 20 minutes then started back up again. Resident John Gibbons said that he heard rifle shots go off a couple of minutes apart. He said he heard someone yell "Get down," then heard four rapid shots. When he went into his washroom he said he could hear a rifle shot directly under his window. Robert DiDiodato said that around 7 a.m, he also heard what he thought were firecrackers. "There was like a bang followed by a bang, bang, bang and rapid fire and then another bang." He said he stepped outside and heard it again and concluded it was gunshots. He estimated about 15 gunshots went off in a 15-minute period. Twenty minutes later, he heard one very loud sound that he thought might have been a rifle. 7:47 a.m.: Fredericton Police Force issues its first statement, via Twitter, asking people to avoid the Brookside Drive area because of an "ongoing incident." 7:53 a.m.: Police announce a lockdown, urging area residents to stay inside and lock their doors for safety. The lockdown was in effect for Brookside Drive between Main and Ring roads. "Our windows broke, and the bullets passed from the wall and go to my son's bed. In front of my son's bed," she said. "And then we came out of [the] building and again we heard the shot." 8 am:. Brandon Ingraham says he woke up to dings on his phone, with friends texting him to see if he's OK because they heard something was going on in his area. Shortly after, he and his wife hear four gunshots a few streets over. Around this time, after about a half-hour pause in sounds of gunfire, shooting starts up again, according to MacCoubrey. 8:17 a.m.: Police say there are "multiple fatalities." 8:20 to 8:30 a.m.: Residents and reporters say more shots are heard. Video captured by a neighbour shows an armoured police vehicle approaching the apartment building and officers firing what appears to be tear gas at a window. "He started shooting tear gas into the apartment … right through the window," said Gibbons. "I would say 15, 20 minutes later, you [saw] the smoke coming out of the apartment." Another witness, who was inside the building where the shooter was located, said he thought he heard what sounded like somebody slamming a dumpster lid. "After the first slam, I heard somebody scream," he said. After the second slam, there was no more sound, but soon after, more shots started ringing out, he said. 8:31 a.m.: At least four people are confirmed dead. 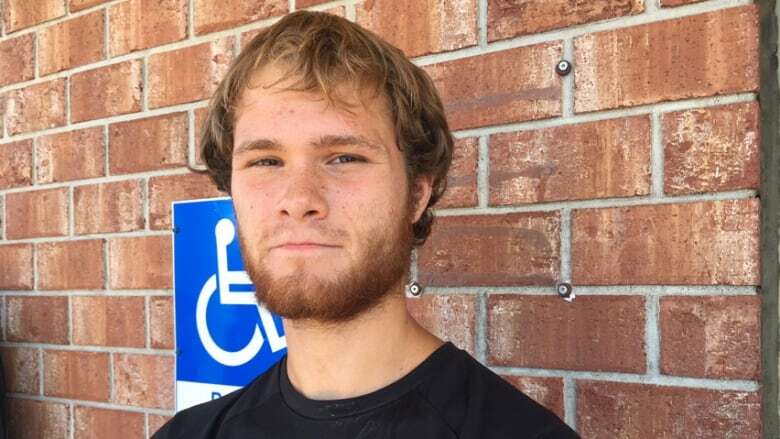 Between 8:30 a.m. and 9 a.m: Justin McLean said he was sleeping in the building next door to the shooter and woke up to the sound of gunshots. He said he looked outside his window and saw a police officer standing with a gun. He went to his back window and saw three bodies lying on the ground. McLean said the police were trying to put one of their officers in their vehicle. "So, I went out and tried to help them, and that's when the shooter proceeded to shoot again," he said. "I never saw the shooter. I saw the barrel of his gun pointed over the window. That's all I could see. He barricaded himself inside the apartment, so they couldn't get in and started shooting outside the window." McLean said he went outside to help the police officers lift the body into the vehicle, but they told him to get down and then brought him to safety. 8:47 a.m.: Police ask the public to stop calling the station directly because of the volume of calls coming in. 8:53 a.m.: New Brunswick Premier Brian Gallant issues statement saying the province is "shock and saddened." Prime Minister Justin Trudeau offered condolences about 20 minutes later. 9:25 a.m.: Police say the situation is still active and ask the public to avoid posting police positions on social media. 9:30 a.m.: Police enter an apartment and arrest a 48-year-old suspect, who is taken to hospital and treated for serious injuries. His name has not been released. 10:28 a.m.: Police confirm four people are dead, including two police officers. 11:04 a.m.: Police lift the lockdown and say the threat to the public is over. 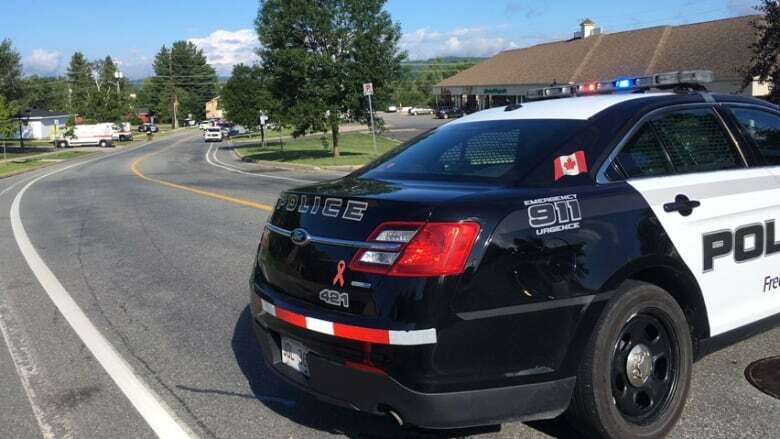 11:06 a.m.: The Dr. Everett Chalmers Regional Hospital in Fredericton says on Twitter it's "currently treating multiple victims of today's shooting." Around 11:15 a.m.: A provincial emergency command post arrives at the scene. RCMP and a canine unit are also there. 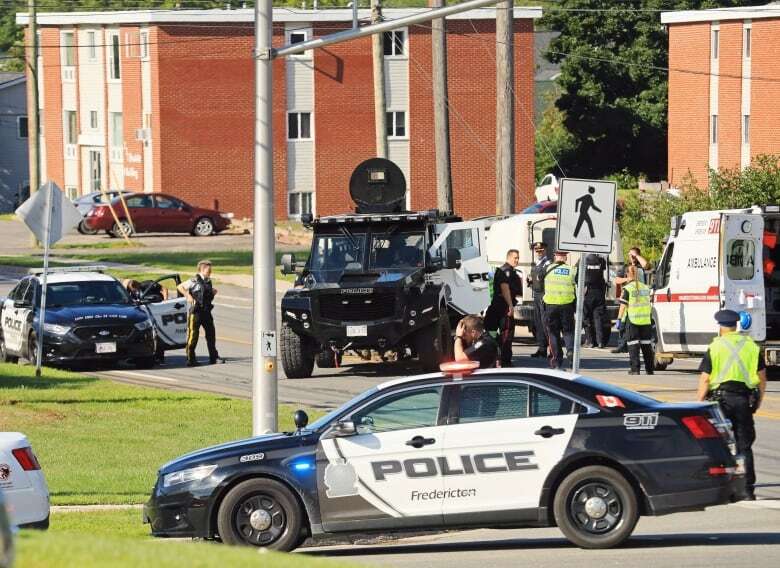 11:23 a.m.: Fredericton police say the suspect is being treated for "serious injuries." 12:13 p.m.: Large police presence outside the Dr. Everett Chalmers Regional Hospital. 12:48 p.m.: Horizon Health asks the public to avoid the hospital emergency room unless a visit is essential. 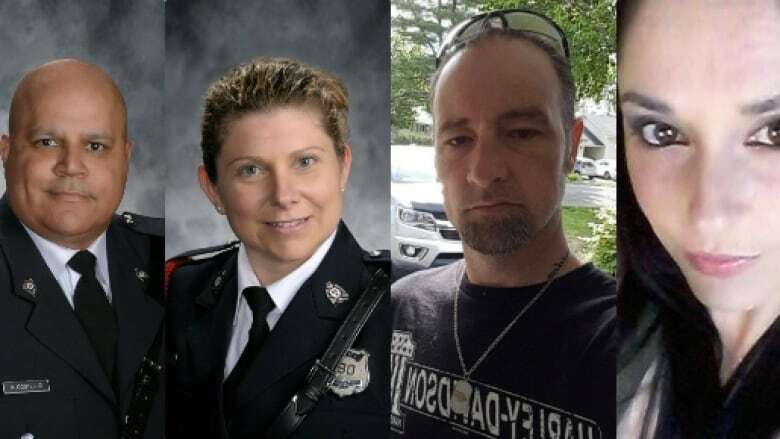 10:54 a.m. Police release name of suspect Matthew Vincent Raymond, 48, of Fredericton, who is charged with first-degree murder in the shooting deaths of Const. Lawrence Robert (Robb) Costello, 45, Const. Sara Mae Helen Burns, 43, Donald Adam Robichaud, 42, and Bobbie Lee Wright, 32.